The Biodiversity Barometer started in 2010 in Brazil, a country that is now part of the yearly survey. In nine years, nine thousand persons were interviewed on behalf of UEBT about their awareness of biodiversity, their expectations on brands' respect for people and biodiversity, and their purchasing decisions. This page shows the responses of ordinary Brazilian people in the UEBT consumer surveys ran in 2018. Street videos shooted in 2016, illustrate the survey outcomes, offering a unique and fun opportunity to view the evolution of the results. Biodiversity, deeply rooted in the Brazilian culture, is a familiar term for most Brazilian people. They acknowledge the key role that companies can have in the conservation of nature benefits offered by biodiversity and their dependance on natural resources. 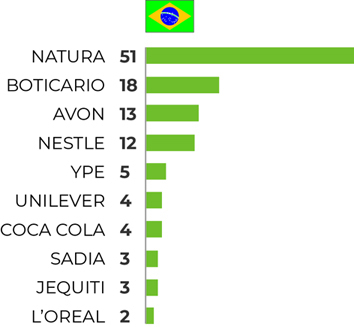 Therefore, Brazilian consumers' expectations towards companies and ethical sourcing of biodiversity are the strongest. 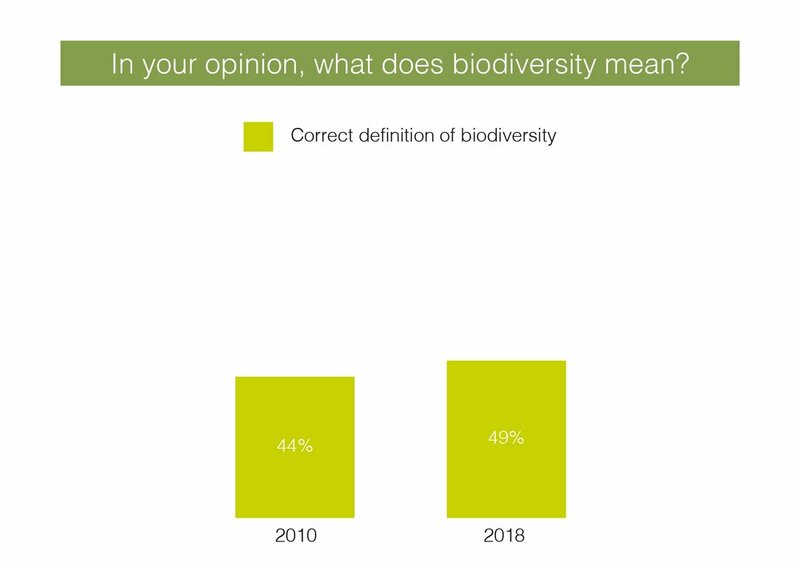 In 2018, 91% of Brazilian respondents have heard of biodiversity showing a slight decrease compared to 2009 (-3pts) but awareness on the subject remains very strong. Biodiversity definition accuracy remains stable with 49% being able to define biodiversity correctly in 2018 same as in 2017. Brazilian consumers feel closely linked to nature with 94% of the respondents believing that it is the obligation of humans to protect nature. Compared to Western countries surveyed, personal involvement of consumers towards biodiversity is much stronger in Brazil. They find biodiversity conservation important for their well-being, feel it will affect them personally if biodiversity disappears and that they have to personally contribute to its protection. Brazilian consumers strongly believe that companies have a role to play. 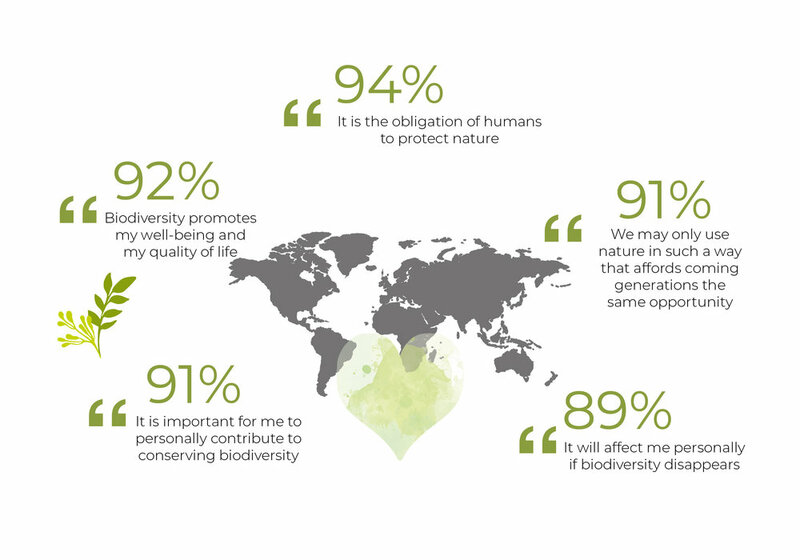 88% (among which 72% completely agree with this statement) of Brazilians interviewed in the survey think companies have a moral obligation to make sure they have a positive impact on society, people and biodiversity. Only 54% of them actually believe companies pay serious attention to ethical sourcing of biodiversity underlying their need to be reassured on companies' involvement towards biodiversity. Being informed on companies concrete actions towards biodiversity is a major expectation in Brazil (88%) They also tend to have more faith in companies whose commitments is certified by an on-product label. Compared to other Western countries surveyed, Brazilian consumers pay much more attention to any type of information on the packaging of a product. For them, transparency, both in terms of impact on biodiversity and of ingredients (extensive list and origin) are the main elements that consumers expect to find on a product. It is the only country that puts the impact on biodiversity as the most important information they should get on the packaging of a product while other surveyed countries are more attentive to the list of ingredient composing the products. Brazilian consumers are more involved than other surveyed countries especially when it comes to buy products that respect biodiversity. Indeed 89% of consumers surveyed in Brazil believe that they can positively impact society by buying products from companies that respect biodiversity and people. They feel responsible for the conservation of natural resources through their consumption habits. Also, 89% feels good when buying such a product and 76% of respondents buy products from company that they know pay attention to biodiversity, the highest level in all surveyed countries. In 2018, when asked about brands that respect biodiversity, most Brazilians (78%) were able to mention at least one brand unlike their counterparts from other countries especially from Europe. The ranking below shows Natura is, by far, the most well-known brand for taking actions in favour of biodiversity. The 2016 videos below shows that already back then, when asked about a brand that respects biodiversity, most of the interviewees already mentioned Natura. When questioned about how they got their information from, Brazilian people mostly answered from Internet, television and advertising.